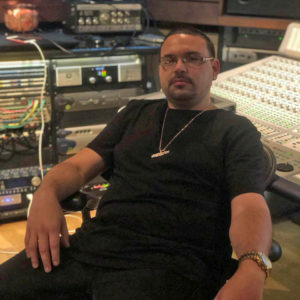 Lorenzo Cardona, born and raised in Perth Amboy, NJ, has been nominated for his first Grammy, for his engineer work on rapper Post Malone’s song “Rockstar,” featuring 21 Savage. The hit is on Post Malone’s album up for the Grammy’s Record of the Year. The song “Rockstar” broke Spotify records, with 650 million streams worldwide and 4 millions streams a day. The song was also officially the 2018 MTV VMA Song of the Year, and the Top Rap Song at the 2018 Billboard Music Awards. Lorenzo, who lives in his hometown of Perth Amboy, is the house engineer at Quad Studios in NYC. In addition to his work with the record-breaking rapper Post Malone, he has worked with a long list of impressive musicians and actors from Cyndi Lauper, to Busta Ryhmes, KRS-One, Kendrick Lamar, Jamie Foxx, Jake Gyllenhaal and many more. The role Lorenzo plays in the studio is recording, mixing, engineering and adding effects, like auto tone on voices. “I work on the tone of the song, the vibe, making it sound the way it’s supposed to sound on the album” he said. Listening to music was a big part of Lorenzo’s life growing up in a Puerto Rican family. And as young as 5 years old, he became curious about how music is mixed. “I remember watching the MTV Video Music Awards on tv and wondering why did the songs sound different live then they did on the records” he said. At Perth Amboy High School, he attended a Career Fair, which taught him about audio engineering as a career path. He graduated from Perth Amboy High in 2005, and then went on to study at William Paterson College and then at Bloomfield College where he graduated in 2011, with a degree in Creative Arts and Technology. But out of school, he got a job in a warehouse in Edison and fast learned how much he hated it. “I was working in a job with terrible working conditions and saw no future there for me.” He also faced some personal legal hurdles, which forced him to take charge and focus on the direction of his life. “I wanted to be exceptional. I did not want to be ordinary, I wanted to be extraordinary,” he said. He decided to seriously purse his interest in engineering. He took a day off from work, and went to NYC and bombarded recording studios, visiting as many as he could and gave out his resume. He found Quad Studio and really liked it there. He met with them but wasn’t sure of their interest. At his sister’s urging, he sent them a follow up email thanking them for the meeting and repeated his interest in working there. And being a go-getter paid off. Lorenzo got offered an internship at Quad Studios. He began interning, “mopping floors, basically doing anything they needed working hard, day and night” he said. After 13 months from Sept 2012- Oct 2013, he was hired as an engineer. He was trained by their top engineer and began getting good reviews from the clients. Now he is the house engineer at Quad Studios, working all the biggest sessions, teaching all the interns, and giving them advice. Lorenzo wants to share his success story, to help motivate others to aim high and believe they can do great things too. He is thinking of ways to be active to help the Perth Amboy High School Band Program and also suggested a recording elective class be offered in school and an after school location for students to be creative and write and record their own music. “I am obsessed with my work, and I want to share this passion and drive with my community so they can believe in themselves and try for great things too” Lorenzo said. Lorenzo will be attending this year’s 61stGrammy’s on Feb 10that the Staples Center in Los Angeles. Perth Amboy is proud of you and will be sure to tune in. Congratulations on your nomination!